I’m just getting started fiddling with modular synthesis. Everything I know up to this point is pure book-learning. I’m like the Prioress in Chaucer’s The Canterbury Tales. She has no firsthand experience of the culture (“And Frenssh she spak ful faire and fetisly, / After the scole of Stratford-atte-Bowe, / For Frenssh of Parys was to hir unknowe”). Since it’s possible there are noobs even noobier than me, I’ll explain that ModularGrid.net lets you construct virtual sets of modules. I’m working in the Eurorack format, which is more compact than its predecessors. Many Eurorack modules are loving recreations of items from early in the development of audio synthesis. ModularGrid describes itself as follows: “a database for modular synthesizers with an integrated planner where people gather information and sketch out their modulars.” It’s a very helpful service. Every individual module links through to information about the module, and you can view racks that employ a given module, or share general characteristics with yours. Some helpful people assited me in getting my ideas together for an initial rack by posting their own rough starter sketches in ModularGrid. 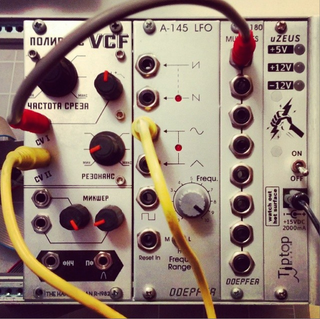 Speaking of noobs, whatever you read here that isn’t self-explanatory can be easily digested thanks to the numerous resources on the web about Eurorack modules in particular and audio synthesis in general. That’s how I’ve been learning. The discussions at muffwiggler.com/forum have been useful. I have this equipment all in a Tiptop Audio Happy Ending Kit with the “z-ears,” which put it at a slight angle. And I have some colorful 6″ and 12″ cords. The rack currently doesn’t have outputs or a mixer because I’m just putting it through my Behringer 802 mixer. In advance of the arrival of the VCO, the EKO, and the Gozinta, I’ve mostly been (1) reading up and (2) doing some basic filtering of sounds that I feed into the Polivoks and then influence with input from the A-145. The sound quality should improve significantly when the Gozinta gets here. Mostly I’ve been using my Buddha Machines and my Gristleism as sound sources, but I’ll be using notes from my ukulele soon enough. My main goal in this modular exploration is to learn how the tools work. But I know the best way to learn is to have a project, so I want to work on hazy ambient-quality sounds and some basic beat-making. I imagine I may add a step sequencer of some sort soon, but I’ll probably use Loopy on my iPad for awhile. If I add too many modules at the start, I’ll just get lost. Also, as inexpensive as the core components are individually, they do add up. Fortunately there is a large marketplace of secondhand modules. I’d like to get a case with a proper cover and handle. I dig the waterproof Synthrotek ones, though I’m not informed about what to use that narrow 1U tile section for. Anyhow, that’s where I’m at. If you’re already deep in modular/Eurorack activity and anything here looks like it’s gonna blow up, or anything looks like it’s missing, I’d appreciate being told so.